The construction required a high level of craftsmanship and was a challenge even to the skilled local builders who put their heart into the construction-work, transforming their scepticism into enthusiasm. The rest stop Hereiane is part of the national tourist-route-project. 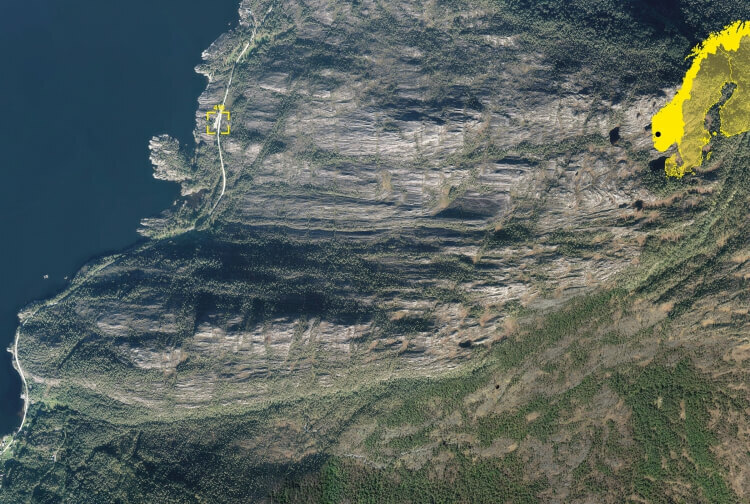 In this case the road leads along the hillsides of the Hardanger fjord, on the west coast of Norway. Beside the fjord-landscape the region is famous for its traditional architecture and hilly cherry- and apple gardens. Hereiane is located 20 minutes from Jondal on top of a big slope of massive rock, which leads all the way down to the water. The use of slate for walls and roofing has a long tradition in the region. With the quarry situated only some 100 meters away, slate as a main component was a logical choice. The geometry of the building reflects the traditional sloped roof, but one wall in the floor-plan is slightly angled, creating a feeling that something is not quite right, when seen from the road. The construction required a high level of craftsmanship and was a challenge even to the skilled local builders, who put their heart into the construction-work, transforming their skepticism into enthusiasm. The walls are constructed entirely from slate-blocks, lifted slightly off the ground. The cut side of the stone facing outwards generates a compact, smooth surface, which makes you want to touch the building. The inside surprises with rough split stone and slick yellow surfaces to form a contrast. The roof is a composite of concrete and slate. The platform with its sitting element and the inner wall, dividing the 2 bathrooms, are made from concrete and coated with a bright yellow surface. The colour helps to balance the heaviness off the building, brightening up the site on rainy days and has become part of the buildings identity, widely discussed by locals. Our intension was to create an emotional, and tangible building that makes people curious and a tiny bit happier. Hege Lysholm - Statens vegvesen?